Q. Does the size of the storage carton impact the cost per cubic foot? A. Pricing is determined by the cubic feet of storage space you need, so your per-cubic-foot price doesn’t change, but obviously a larger carton will cost more than a smaller one simply because it has more cubic feet. Free Initial Transfer - Hansen Records Management will transfer all containers from your present storage facility to our records storage facility free of charge. Free Barcode Labels and Forms - All container barcode labels, transmittal forms, facsimile order forms, and client authorization forms will be provided free of charge. Trial Period - Upon execution of the “Storage & Service Agreement,” we will provide you with a 90-day trial period. If you are not completely satisfied with the level of service we’ve provided, simply submit a written explanation to us of your dissatisfaction, and if it is determined that we are at fault, we will relocate all of your storage containers that are in our facility to a destination of your choice within a 30-mile radius of downtown Milwaukee free of charge. 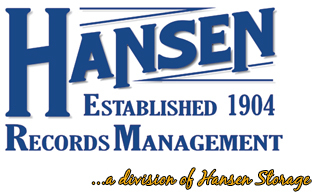 Computerized Barcoding & Tracking - Hansen Records Management uses RS-SQL records management software, the most advanced barcode tracking/inventory technology software available, to manage your inventory.